You ready, Pinellas? Super Bowl LII in Minneapolis kicks off at 5:30 p.m. on Sunday with pre-game coverage, have you made your plans yet? Do you need to know where to find the best places to watch the Super Bowl in Tampa? Looking for sports bars, or just with friendly sports fans and great people to watch the Eagles and the Patriots? In a city like ours, you have tons of choices when it comes to an awesome Super Bowl celebration at a great Sports Bar or Restaurant in Pinellas County. Ferg's Sports Bar across from Tropicana Field located at 1320 Central Avenue is selling $50 all-you-can-drink tickets that will include the Super Buffet featuring wings, nachos and other treats. The event will be held in their second-level bar and is limited to 75 people. Also throw your own private party in the brand-new restored VIP area. Call 727-822-4562. Gil & Rick's Sports Bar and Pizzeria is the place to enjoy Super Bowl Sunday with $10 buffet and drink specials. Reserve your seat at the bar for just $25, which includes buffet and a drink: beer, wine, or well. Glory Days Grill is giving you an All-Access Pass for the game this year in all five of their locations! Starting at 6:30 p.m. on Sunday you can enjoy unlimited food and drink for just $65 until 11:30 p.m. With big screen televisions throughout their restaurants, you have the best seat in the house no matter where you sit. All Access Passes are selling fast, be sure to reserve your seat today. Locations in Carrollwood, North Tampa, Lakeland, St. Petersburg and Palm Harbor. Or enjoy the game from the comfort of your home and leave the cooking to Glory Days Grill with a Super Sunday Spread. Pre-order 16 boneless wings for the big game and get eight free! Or order 50 Jumbo Wings for only $44.99! Choose from their signature Glory Wings and variety of sauces! Norton's Sports Bar and Grill is where you can watch the Eagles vs. Patriots in the Super Bowl, and enjoy a free buffet with the purchase of two beverages. Mugs Sports Bar and Grill at Icot is ready for you to join them and watch the big game on numerous big-screen TVs, and enjoy $7.99 pitchers of Bud or Bud Light and $9.99 buckets of Bud or Bud Light bottles. If you have to take your party on the road, don't forget to order your wings from Mugs at ICOT by visiting the website or calling 727-240-1262. Park & Rec is the place to be if you're a Patriots fan, or like any and everybody but the Patriots. The big game will be on 70 TV screens, with $3 Bud and Bud Light cans as well as $5 Jack Daniels, Jack Fire and Jack Honey drinks. Check out the expanded food menu or walk next door to The Avenue Eat + Drink for more food options. You can also try the Quarterback Toss Challenge and win $100 for first place! Quaker Steak and Lube is open for business and ready for you to watch the Super Bowl in Pinellas Park, or you can make your order ahead of time and enjoy the Big Game Deal of 30 bone-in wings and 30 breaded boneless wings for $49.99. Order 100 bone-in wings for $99.99 or 100 boneless wings for $69.99. Add a full rack of baby back ribs to any order for $14.99. Varsity Club in Clearwater allows you to reserve your table, but be quick because spots are filling up fast! If you can't get a table enjoy the game in their game room, or head to the bar and enjoy $13.95 buckets and $8.95 pitchers. 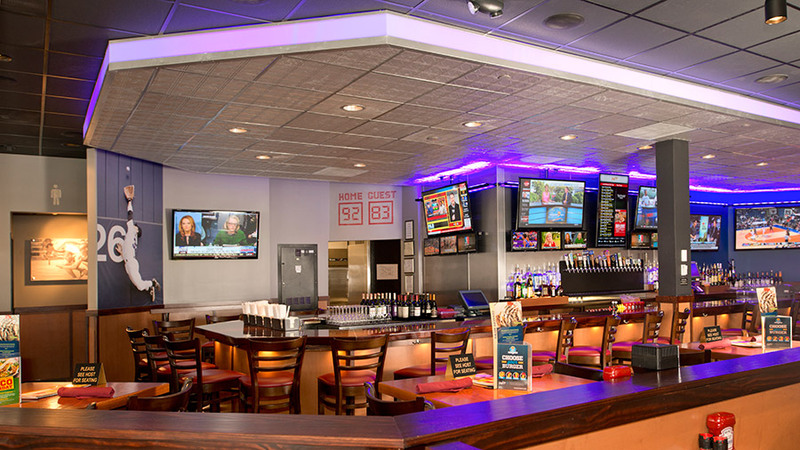 Xone Sports Bar & Grill is where you can watch The Big Game on over 25 TVs. They are doing $12 bucket specials on domestics and pitcher specials. The Budweiser girls will also be in the house raffling off a 55'' TV and several other prizes. Staying home and looking for information about hosting your own party with ease? Read about how to do so in our article on How to Host the Ultimate Game-Day Party. It includes everything you need to know about food, a TouchDown Punch recipe from locally made Touch Vodka and ways to keep your guests engaged, even if the game is a blowout. Looking for more articles on sports in Pinellas County? Check out 727area for more.